The LGBT Age Capacity Building Project has launched a suite of resources to support older people’s services to become more welcoming and inclusive of lesbian, gay, bisexual, and transgender (LGBT) people. Part of LGBT Health and Wellbeing, and funded by Reshaping Care for Older People’s Innovation Fund, the project was set up in response to the barriers that older LGBT people face in accessing services. While many LGBT people can live their lives much more openly today, most still face assumptions and prejudice, and many face rejection by family and friends, harassment, and hate crime. It’s important that services understand the issues that LGBT people have to negotiate, in order to be proactive in creating a space where LGBT people feel safe to be who they are. To support organisations to provide the best services they can to older LGBT people, the LGBT Age Capacity Building Project ran a series of seminars and events, alongside workplace training sessions. In consultation with older members of the LGBT community and professionals working in health and social care services, the project produced a set of resources, including: a short film, a top tips booklet, the LGBT Age Audit Tool, activities and support for running LGBT awareness sessions, and a set of practical info sheets on inclusive imagery, the needs of older transgender people, and creating safe spaces. Ten Top Tips for becoming more LGBT-inclusive: this booklet is a great introduction to the issues that older LGBT people face, and includes a wealth of practical things that you can do. It was developed in consultation with older LGBT people, and includes poetry, prose and visual art created as part of our Lifelines intergenerational storytelling project. Five tips for providing services to older transgender people: the needs of transgender people are often overlooked or misunderstood. This infosheet provides specific, practical tips for supporting older transgender people. LGBT Age Audit Tool: aimed at individuals and teams providing direct support services to older people, this tool is designed to help identify practical steps towards ensuring LGBT-inclusive practice. Creating a safe space: one really positive thing that you can do to make sure that LGBT people feel safe, welcome and included is to introduce a safe space commitment, which sets out the expectations for everyone in the space. This resource is designed to help you develop a safe space commitment and put it into practice; it also includes some useful phrases for upholding it in trickier moments. In the frame – creating inclusive imagery: these ten tips, written by photographer Becky Duncan of Open Aye, are designed to help you to create publicity and information materials which proactively send the message that LGBT people are welcome in your services. 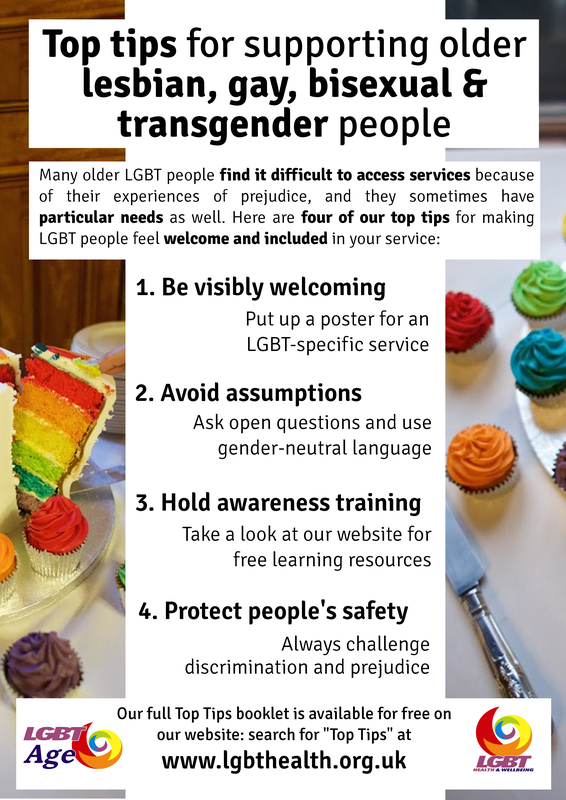 Top Tips Poster: this poster includes four tips for supporting older LGBT people along with practical actions that everyone can do right away. It’s designed to go up on staffroom noticeboards, and is a great way to get your colleagues thinking and talking about inclusivity. Community Consultation Executive Summary: we surveyed 182 older LGBT people to find out what they want in terms of social opportunities, information and support. The report can help to inform the work you do to be become more LGBT inclusive. What we did – a summary: an at-a-glance guide to the work of the project and the impact that it’s had. Impact Report: sharing the learning from the LGBT Age Capacity Building Project as a whole, this report will be useful to those who are interested in understanding how to change services to better meet the needs of older LGBT people, whether within their own organisation or in a wider capacity building role. It may also be of interest to members of the LGBT community who would like to know more about the work being done to make services more inclusive. The report details how the project was run, what we learned, and what changes the work created. These days, many professionals are keen to make sure that they are inclusive and welcoming, but it’s something which hasn’t always been talked about, and often it can be difficult to know where to start. Running a training session will support your team to find out about the issues and language, and get comfortable discussing gender and sexual orientation, so you can avoid assumptions and effectively challenge prejudice. The files include everything you need to facilitate the activity – aims, instructions, and worksheets. How to run your own LGBT awareness training: this resource is designed to help you plan out your training session, and includes some example session plans and tips, as well as a list of resources. Quiz – PowerPoint presentation and notes: this quiz is an introduction to some of the barriers that prevent older LGBT people accessing services. It is designed to get people thinking and talking, and to build knowledge and understanding of the issues. Looking at language – instructions, cards and answers: this activity is designed help you to get to grips with some of the words that relate to sexual orientation and gender identity, to equip you with the language to talk about it, and to help you avoid using offensive and/or outdated words. LGBT Timeline – Instructions and Worksheet: Want to run your own awareness training? This creative activity will help you to think about LGBT life histories, getting into the shoes of older LGBT people and developing an understanding of some of the issues they have faced during their lives. The two files include everything you need to facilitate the activity – aims, instructions, and a worksheet. We’re developing a series of these resources, so watch this space for more! Are We Being Served? : a 22 minute video in which LGBT community members reflect on their experiences, hopes and attitudes towards mainstream services as they get older. The film is a great resource for running your own awareness raising training session, either by yourself or in a group. These training notes will support you to get the most out of the film, and are designed to help you to draw out the key issues and think about practical ways of engaging with them in your own practice and/or organisation. Naked Among Thistles: this anthology includes creative writing that you might like to read out to the group, especially the pieces on p38 and p54. Transvisions: a short film about transgender people’s experiences and identities. LGBT Health and Wellbeing produce a range of other online resources including eBulletins, publications, impact reports, films, audit tools and event reports. Stand Is Cottaging Legal In The UK?